It’s been hard to resist the draw of the “Rapture” scheduled for Saturday. It kind of makes posting here irrelevant, yet I am compelled to do so anyway. But what I wanted to focus on was less about “Judgement Day” and more about judgement in general. How do we let others know our stance or beliefs about issues, topics or events? How do we clafify something that to one seems reasonable when to another it seems impossible? Where do we make room for tolerance, acknowledgement, if not understanding? In my practice I have developed a theory (which I really should copyright or something) which I call “the Velvet Rope”. This velvet rope is the visual analogy that I use with clients to embody boundaries. Often when clients, or anyone for that matter, hears the word boundary we tend to conjure up images of brick walls, steel gates, impenetrable fortresses worthy of Get Smart. But in reality we have many boundaries, like a velvet rope, that embody a clear signal, share information yet are open and unimposing. By that I mean that one can see past the velvet rope, it allows information to transfer freely while also setting a clear limit without force. I introduce this theory to clients and then add in the stance of non-judgement. 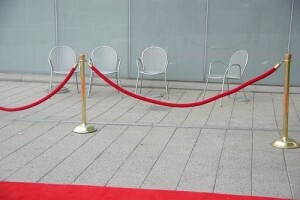 I don’t judge someone who puts up a velvet rope. I believe them and understand that they are telling me something that I can either agree to and conform to be allowed inside or I can choose to say no thank you and move on, all without judgement. Take the fancy restaurant as an example. You can find a velvet rope outside of one and it lets you know who they are and what is required to “play in their clubhouse” which may entail a week’s paycheck for a 5-star meal. It is a boundary that they set and then don’t hold it against the passer-by who chooses to keep looking. It conveys information to both parties; this is who we are and what is required by you (money, dress code, etc.) to join. A velvet rope works well when we think about more emotionally charged boundaries too, like the ones we need to set with family, co-workers, or even those who believe in Judgement Day. It is informational, protective, clarifying and always, we strive for it to be non-judgemental. It’s OK that you choose one side of the rope over another, it’s not personal. This theory takes some practice but you might find it useful when setting limits with a nosy friend or a rude relation. Yes, sometimes there is initial surprise or rebuke because it wasn’t there before. But it doesn’t take long for others to get used to it and believe it and then either edit themselves to allow inclusion or for them to move on. Boundaries don’t have to be big or mean to be effective. And they don’t have to convey judgement either. This entry was posted in Educational, Good Things and tagged boundaries, boundary, clear lines, Get Smart, informational, judgement, judgement day, limits, non-judgement, protective, rapture, the velvet rope. Bookmark the permalink.